Syrian Kufta (Kawaj) is a a potato, tomato & minced meat bake, an easy weeknight dinner but this time it gets even easier with the slow cooker. 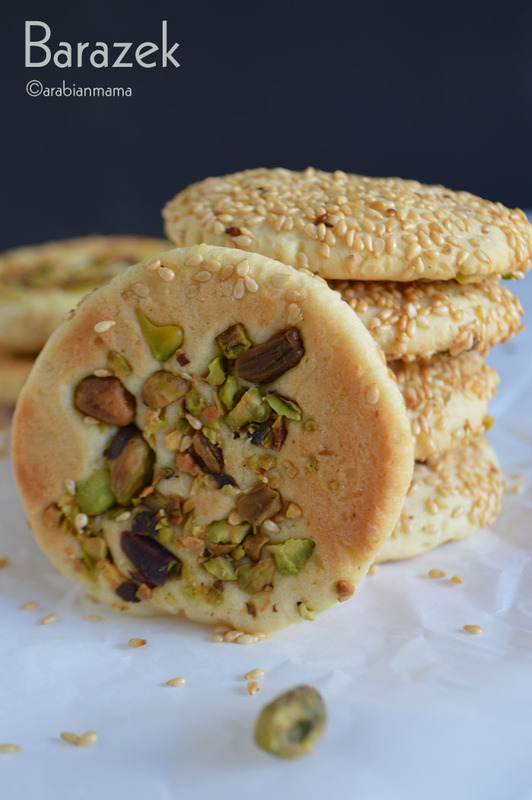 Syrian Kawaj recipe, is a recipe I’ve been making for years now without knowing its name!!. For me it was just a simple potato meatballs casserole that is swimming in tomato sauce, as simple as that. An easy recipe yet delicious . 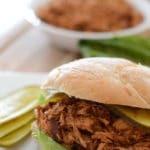 Kids loved it, hubby loved it, I loved it so it was a win win recipe. 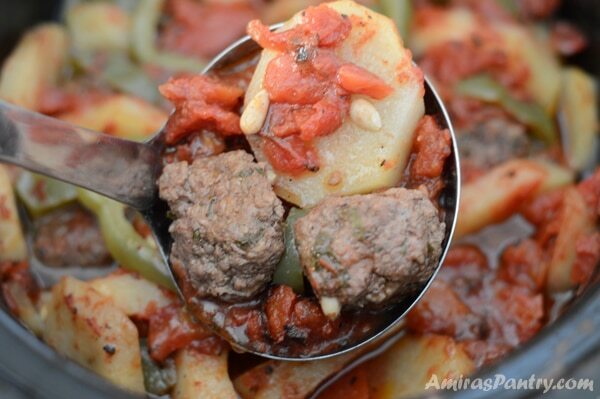 Until recently when I was searching for a Syrian recipe to make – as a tribute to this great nation which suffered, and still suffering a lot- and happily found out that my good old potato meatball casserole  is actually of a Syrian origin. 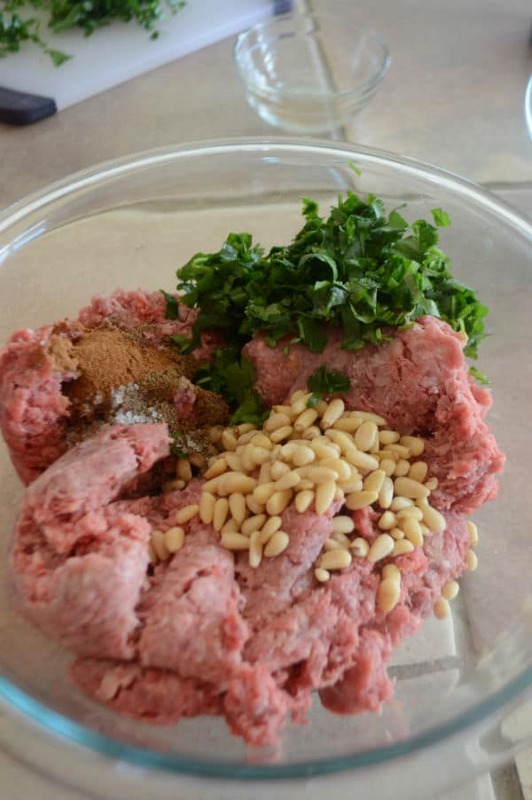 We’ll start simply by mixing meat, pine nuts, parsley and spices. 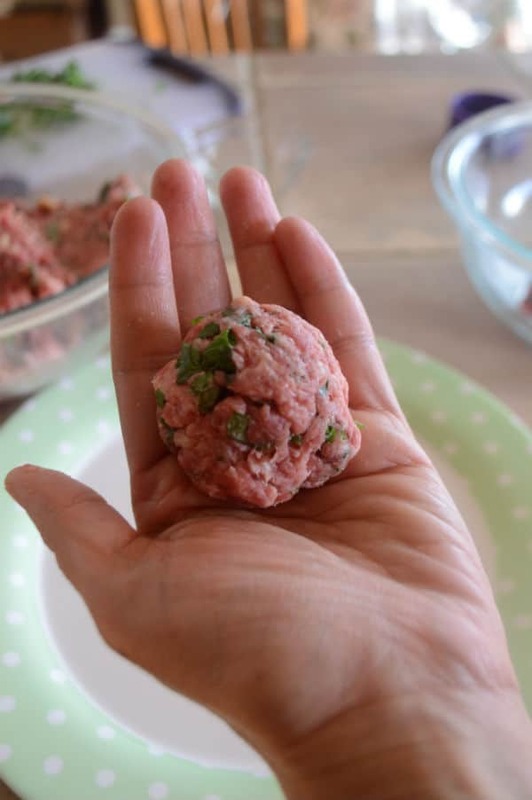 Then form meatballs as big or small as you like. Heat up a large, deep skillet over medium high heat. Carefully place the meatballs in the pan. Allow them to get browned along the top and bottom. 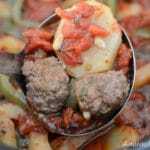 Now arrange the meatballs,potato and bell pepper in a nice pattern, this is specially looks cool in an oven dish. Then cover with diced tomato. Set it and forget it . The ease of this recipe is going to please you, my friends. 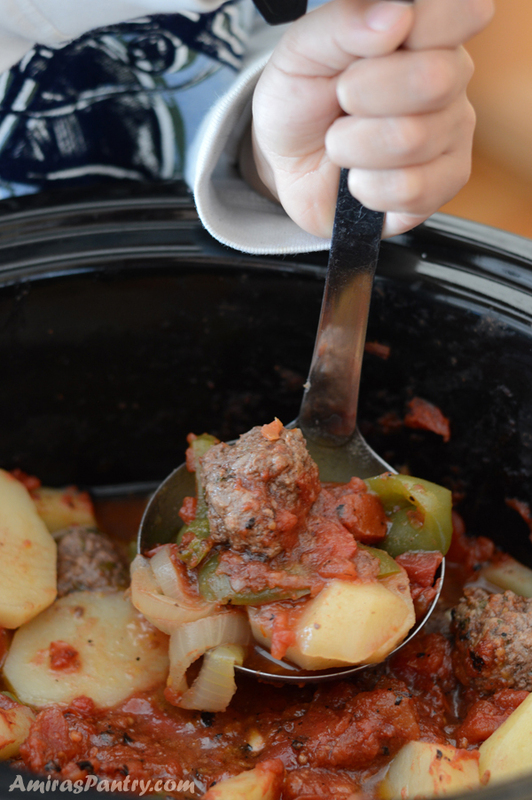 A very delicious, kids approved easy weeknight meal. Serve with white or brown rice on the side. I hope you’ll like this simple Syrian recipe. Please do not forget them in your prayers ❤️️. May peace prevail. I’ll end this post by a lovely quote: “Injustice anywhere is a threat to justice everywhere.” Martin Luther King Jr.
1 ½ lb ground meat . ½ cup chopped parsley I used a combination of parsley and cilantro, optional. 2 cans diced tomatoes or 8 medium fresh tomatoes peeled and diced. 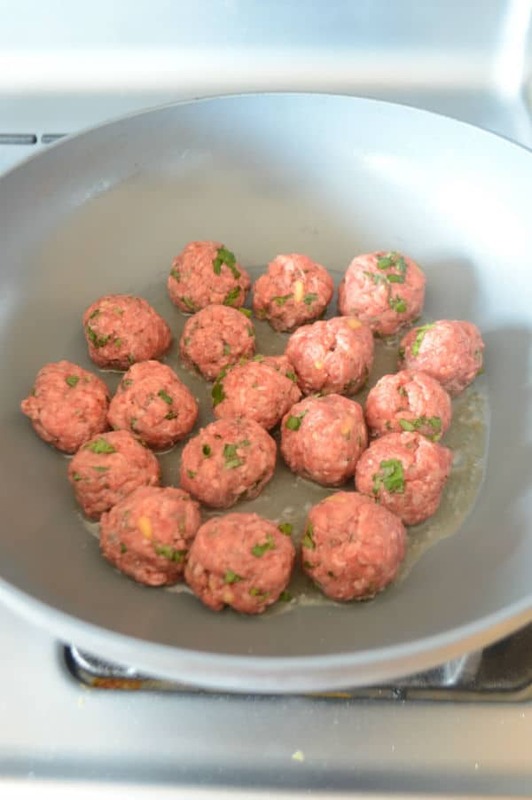 In a large bowl, mix the first 7 ingredients well and shape the mixture into golf ball sized meatballs. Heat oil in a skillet and brown the balls, not cook them just brown for about 2 minutes from all sides. Work in batches if necessary. In your crockpot arrange onion slices at the bottom. 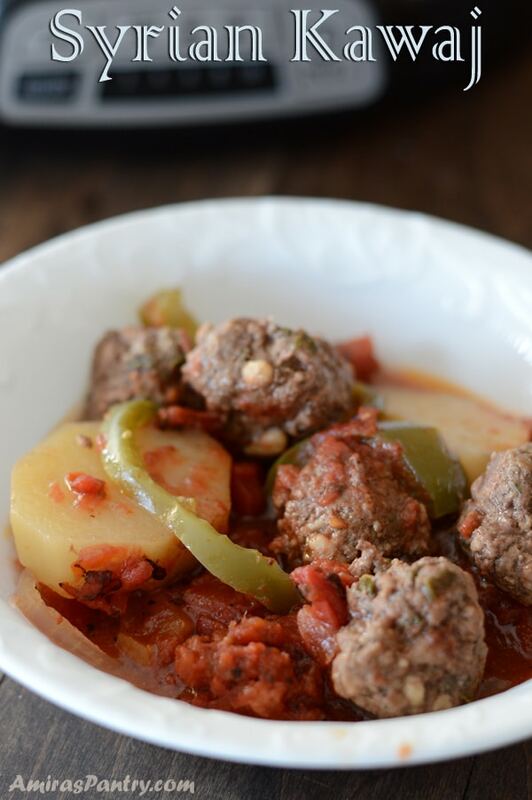 then top with alternate meatballs,potato slice, and green pepper, alternatively. Mix diced tomatoes with salt and pepper and dumb in the crockpot. Pour the water over and let it cook on low for 6-8 hours. 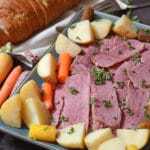 Serve with white / brown rice, bread and a nice green salad. 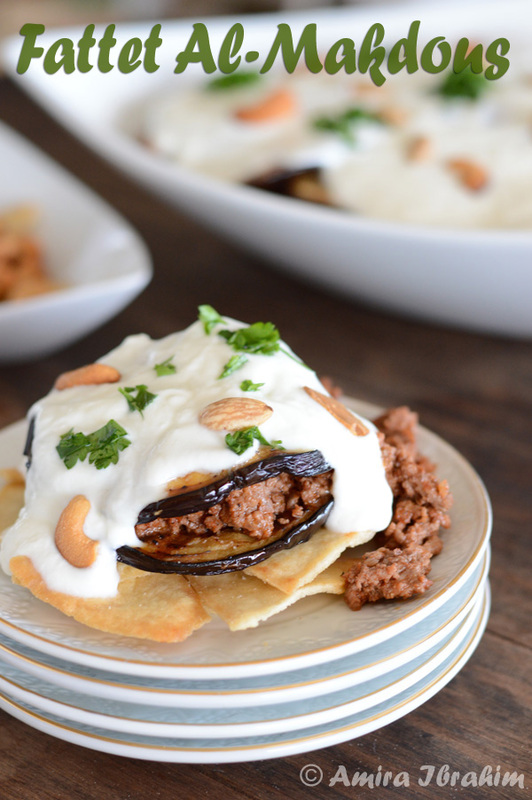 Need more Syrian recipes? Check them out here. Thanks for you blog. You do a great job. Having lived in Damascus for a number of years..during a peaceful time…I really appreciate your efforts at bringing the plight of that hospitable and wonderful people to the attention of your readers. Keep up the good work. Thank you Kaukab for you sweet comment, I hope you’ll like the recipes. Too bad you don’t answer questions your readers have! Ooops, sorry Mariam , this is sometimes the case with 3 crazy boys :). I do my best in replying everyone. For your questions though, I buy my minced meat at Costco so I think it was 87% and yes you are right there is no onion in the meatballs, instead the onions are sliced in the pot itself. 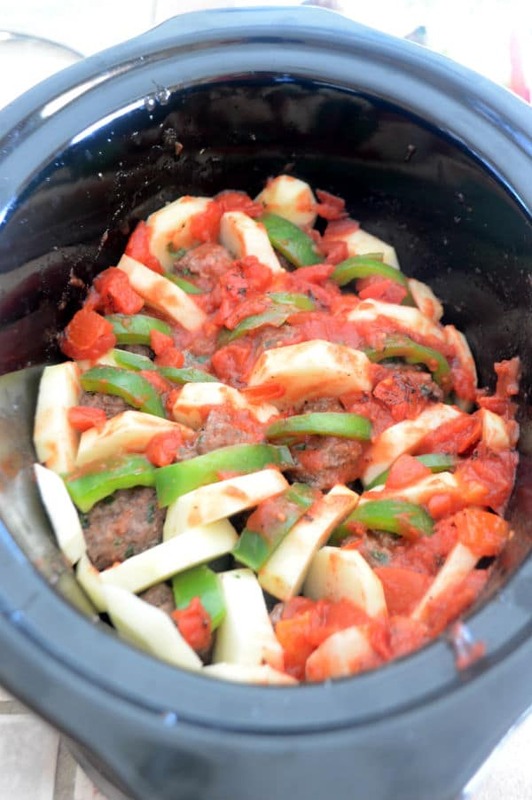 You do not have to have a slow cooker you can make it in a pot on the stove top or even in the oven. For the oven arrange the dish exactly as stated above then if possible let it boil on the stovetop then simmer for 10-15 minutes, after that pop in the oven until completely done. 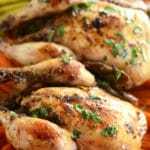 If you do not have a dish that can go both ways- in the oven and on stovetop- then simply cover with foil and pop it in a 380F oven until done, it will take longer so check every now and then as we do not want the liquids to dry leaving you with a burnt dish. This looks amazing ! 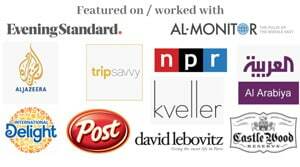 As does your whole blog… have few questions I’m new in the kitchen . What meat fat ratio do you use for this and there is no onion in meatball like in Kafta right? and if I don’t have a slow cooker how can I make this in oven?